What are the advertising options on and inside RedCab taxis? The easiest way you can connect with your customers is by placing your message where they spend significant part of their time – on the road. Taxi advertising is a perfect platform to promote your brand in a highly visible AND stylish format. It attracts attention and cab’s red colour will efectively highlight your ad in a transport stream. Ads on RedCab Taxis exterior. Exterior advertising is seen by thousands of people every day. Bold designs, colourful images and simple statements; the widest cross-section of the public will soon recognise and recall your brand, giving you the edge in today’s highly competitive consumer marketplace. Ad on the back of cab will be visible for other drivers, but on the sides of cab - more visible for pedestrians. This format of advertisment guarantees visibility on a wide region, creating thousands of impressions on your potential customer base. Click here for available advertising spaces and sizes. 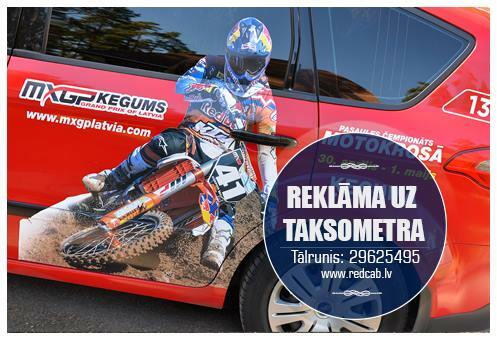 Taksometru reklāmas laukumi apskatāmi šeit. Ads on a front seat backrests. They carry more detailed information and the passenger has the opportunity to read the more detailed message. Suitable for logo, slogan or Your trade-mark advertisement. Advertisement box on the back of the drivers seat. Transparent box suitable for placing different booklets, flyers, business cards – anything that can attract a persons attention sitting in front of it.